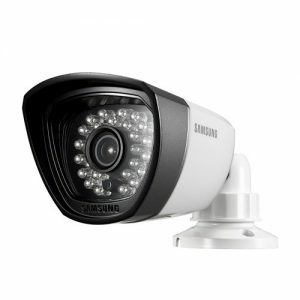 The Samsung SDS-P5122 is a high-tech incredibly versatile CCTV sysytem for people who need the best, and/or have a large amount of space they need to run surveillance on. This Samsung All-In-One DVR Security System comes with 12 wide angle night vision cameras to protect your property. The modern era of CCTV recording offers so many benefits. With this Samsung system you can set up email warning alerts that contact you each time the cameras motion sensor is activated. You can then view footage on the iPolis app and judge whether or not it’s time to call back up. The great thing about this is your security is always monitoring your home or property even if you are away on business or vacation. The SDS-P5122 takes security one step further. It even contacts you if it detects it is being tampered with. Keeping you one step ahead of the criminals. The DVR is 16 channel, so you have the option of adding another 4 cameras if you ever need to. Why is this good? Well if you have set the cameras up in key locations and you ever expand your property or warehouse then you can still use your existing system without having to upgrade. Smart thinking. The cameras are weather resistant and offer night vision recording which shoots coherent images up to 82 feet away. The cameras record in the 960H format and they offer crisp, true to life colors.A 1 TB hard drive comes with this package. The reviews of this system from verified owners has been really good. The main points of satisfaction are the ease of set up and installation. Footage also looks great on the app even on a smartphone. Images are also that clear that you can read number plates on cars parked around your property. Not bad at all for a non HD system. Customer service from Samsung also got a lot of brownie points.